WE HAVE A DUMPLOAD OF TICKETS TO GIVE AWAY FOR THREE DIFFERENT EVENTS THIS FRIDAY. TELL US WHY YOU WANT TO GO TO WHICH EVENT INSTEAD OF THE OTHERS BY COMMENTING ON THIS POST ON FACEBOOK TO WIN FREE TICKETS FOR AMSTERDAM’S FINEST EVENTS THIS WEEKEND! On April 1st our capital’s underground club Studio 80 will be packed with E! One of Amsterdam’s finest agencies, We Are E, will set a new milestone: their own brand new record label WE ARE EP. For this occasion one of my favourite French producers of the moment will fly over: Rodriguez Jr, plus dynamic duo Loops will have the honor to release it’s first EP. Sounds like a plan. They’ve been throwing massive parties around Amsterdam for the last 5 years or so and became a serious organization when it comes down to electronic extravaganzas filled with lazers, neon lights, bodypaint and black lights. On April 1st they’ve invited last summer’s hit Laserkraft 3D, De Grote Vinnie Donnie & Sjakie Show, Simon & Giographic A.K.A. Booze & Shoe and DJ Wurtz. Bound to sell out soon, luckily we got 2×2 tickets to giveaway. After an amazing sold out 5th edition during 5 Days Off at Paradiso, Colors is now returning to her home-base, Trouw. 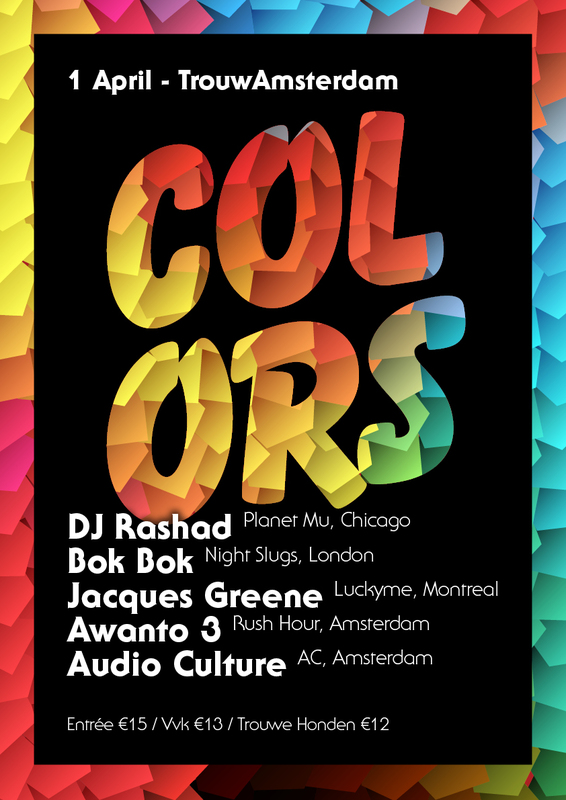 This edition will see DJ Rashad (Chigaco), Jacques Greene (Montreal) and Bok Bok (London), who previously headlined Colors last October during the prestigious Amsterdam Dance Event, onstage. As if that’s not enough, Tom Trago will officially be presenting his new album ‘IRIS’ in de Verdieping! Expect a wide variety of UK & US house and bass music. To be a part of all this, yes yes, we’re giving away 2×2 tickets! The best party in town this weekend when it comes down to warm house, techno and disco music. No one other than our big friend Simon Weiss will be onstage followed up by local heroes Homework and Belgian duo FCL (San Soda & Red D). The first of crazy animalism parties in the renewed areas of the Chicago Social Club, be a part of it, once more, comment on Facebook for a 2×2 ticket giveaway! The one and only party this weekend with melodic deep house written all over the place, Pleinvrees is ready to hit the clubs of Amsterdam (in this case Club Roses). For the occasion, they’ve invited the French master of melodies Joris Delacroix together with Dutch equivalent and local hero Arjuna Schiks and Miss Melera. Can’t wait for this one people, unfortunately it’s sold out, but they’ve reserved 50 tickets at the door, so be early. 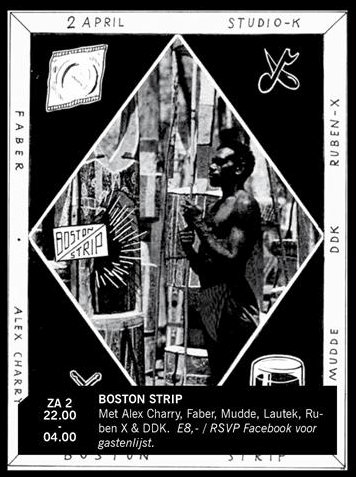 Boston Strip has been carrying a decent soundsystem around for a while, this time around they’re carrying it to the dancehalls of Studio K. Featuring Alex Charry, Faber, Mudde, Lautek, Ruben X & DDK, be sure to RSVP on their Facebook event page for a free guestlist spot. Vibes: Disco, House, Anything UK (funky, garage, dubstep, grime), Techno, Dancehall, Bashment & Hiphop.